Gregg Popovich, the head basketball coach of the San Antonio Spurs, is known for his gruff style when it comes to media interviews. Yet, Popovich’s heartfelt comments when speaking about the recent death of TNT reporter Craig Sager from leukemia made it clear that intimacy and respect defined their relationship. End of the year holiday wishes are often a syrupy affair. Let’s be honest about, OK? People you don’t really know or vendors primarily interested in your budget send along a generic note, card or Email expressing hope and prosperity for the coming year. If you’re super duper lucky you may get some chocolate or a fruit basket. Impact #1: Be genuine in how you treat others, even when it is something they don’t want to hear. Last week I got fired by a client who I’ve supported for a decade due to budget pressures. Candidly, our personal relationship has been strained. Yet, she picked up the phone and called me, rather than taking the easy route by shooting out an Email. It was genuine! Impact #2: Whatever it is that you do, do it with style; regardless of what some may think. Sager was as known for his colorful attire, as for his professional accomplishments. Some mocked him for his wardrobe believing it devalued the contribution of serious sports journalists. Yet, Sager stuck to his belief that his uniqueness allowed him to foster closer relationships. Impact #3: Life is all about relationships…with family, friends, colleagues and clients. When you have that then everything that comes your way is so much better. A visual image makes things memorable. Here is an example. In England during the 19th century doctors were less than reliable when it came to declaring someone dead. 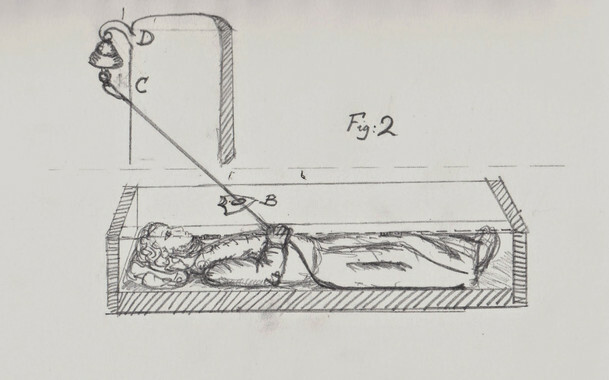 For that reason, people were often buried with a cord inside their casket attached to a small bell hanging above their grave. If they happened to wake up, they could give that cord a tug to alert bystanders that they were alive. The take-away for marketers is to think visually to present a compelling value proposition or credible differentiation for your company. This isn’t custom photography or a snappy illustration. It is about the power of words and the ability they have to paint a picture in the mind of your customers, prospects, partners and influencers. You’ll cut through. You will stay top of mind. A work obsessed hedge fund manager boards a train with his daughter. As they prepare to depart, a young woman stumbles on with a bite wound on her leg. The nightmare begins. This is the set-up for the South Korean-made zombie movie Train to Busan, which has smashed all box office records in that country. Busan’s success provides valuable lessons for corporate marketers who subscribe to the importance of story telling in their communications programs. Lesson #1: If you exist in a crowded market segment, play up a unique attribute – either real or perceived. Let’s stick with zombie movies for comparison. Night of the Living Dead created the modern genre in 1968. The movie was fresh and innovative, which is why it attracted hordes of fans. To garner interest today, zombie fare most sport some sort of creative distinction (i.e. zombies on a train) or be presented in a different media, such as AMC’s The Walking Dead. Lesson #2: Give your audience what they want…and lots of it. Zombie movie fans want to see the undead chasing and biting. That’s why they plunked down their money. Marketers should follow suit. Understand your company’s value proposition to key audiences and lead with it in Web, digital, social and sales-related communications. Lesson #3: Star power drives interest and attention. Train to Busan features one of South Korea’s rising talents. World War Z had Brad Pitt. This is the business case to invest in thought leadership to enhance the visibility, reputation and credibility of your company’s senior team at corporate and customer facing field reps. The bite is on! What marketers can learn from zombie movies like Train to Busan. That sage advice from the instructor at the DC Improv was my welcome to the world of stand up. Fast forward a decade and nearly 200 performances, and I’ve come to learn that…indeed…it does help when a routine is funny. Funny is subjective though. There is a process to comedy and a successful show is influenced by three things: 1) originality; 2) relevance; and 3) timing. Recently, I spoke with a marketer who is a new hire for a long-standing Strategic Communications Group (Strategic) client. Her company is ratcheting up their investment in content creation and she has been gathering best practices. Define an editorial strategy. What do you want to communicate to readers? Why should they care? You have to think like a publisher and a journalist, rather than a marketer. Make your content unique. Articulate thoughtful opinions, feature exclusive profiles of industry influencers and publish rapid response to timely market developments. Create a personality. Is the focus on lessons learned to help customers succeed? I call that “sharing and caring.” Want to quickly change or disrupt the status quo. That’s the “angry man.” You choose the approach; just stick with it and be consistent. Here is video of my joke to open the Inbound Marketing Summit in San Francisco. It is original, relevant to the audience and well timed with a double punch line!